Earlier this week I came down to Portland, Oregon to spend some time visiting with family before heading to the Oregon Coast for the Thanksgiving holiday next week. Ever since the morning I left the island all it has done is rain! Rain on the entire drive, rain through the nights, rain through the days! It's been good weather for enjoying things like Powell's Books, but not good weather for getting out and birding. No improvement is in sight - in fact, it is snowing right now on San Juan Island and we've got a chance of snow here on Monday! We'll see what happens. 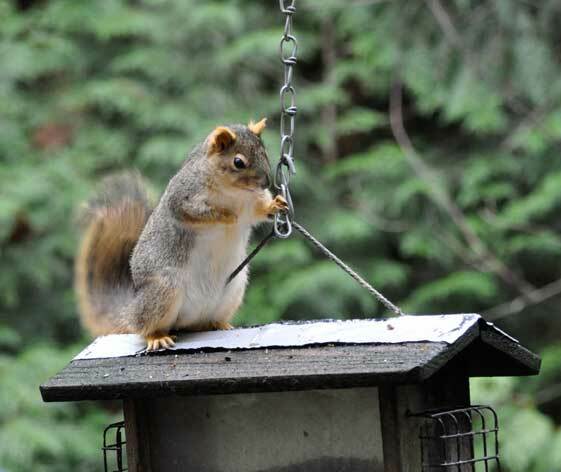 I've also seen red-breasted nuthatches and dark-eyed juncos, both species that visit my houseboat feeder, and black-capped chickadees, closely related to the chestnut-backed chickadees I regularly see. The other highlight this morning was a varied thrush pulling insects out of the leaf litter in the front yard. Hopefully I'll get some more photos at the feeders this weekend if nothing else, but I'll be out at the coast rain or shine (or snow!) so there will hopefully be pictures from that, too! Hope you've got a good waterproof jacket, Monika, prdictions are for a wetter and cooler than normal winter for the NW US this winter. Stellar's Jay looks a beaut! Great shot of the Stellar Jay, Monika. I am so happy to find another who loves Stellar Jay's. They were good friends when I lived in Robe Valley (Granite Falls, Washington) but the locals considered them garden theiving pests (they do love new pea shoots). They were thick as thieves in the valley. 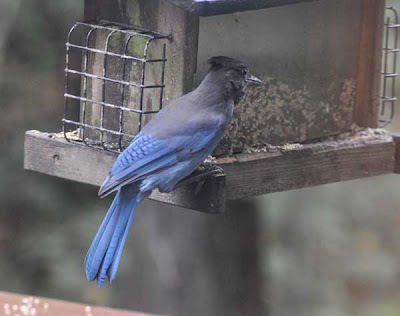 Now I live in Everett and am thrilled when I see the rare blue flash of tail feathers or hear their ruckus gossip. Dave - The rain gear is ready! At some point I will just have to go out exploring regardless of the water. Makes it tougher for photography, though. Lois - I think they may eat my parents out of house and home this year. I enjoy watching them, but I'm thankful they aren't around to raid my feeders on San Juan Island! Rainsong - I certainly miss seeing them on San Juan Island, and I love watching them when I'm in Portland!